You can use any 5+ star REM (or collab REM) monster as the assistant onto a card of your choice (the base does not have to be an REM monster). In order to do so, you will require a new material called Tan. These Tan will be available through a special 50 stamina dungeon (or MP shop), but the colour you receive is random and will require you to run numerous times to acquire the correct combination. You can cancel the transfer at any time, but will not have your TAN or gold refunded. The required coloured Tans vary from monster to monster and are easily displayed as shown in the image below. Only monsters that qualify for assistance will have that new yellow star on their icon. When ready to perform the transfer process, you simply hit the Skill Transfer / Remove button in the Monster Menu and select your base. Your base monster must have an active skill. Skill inheritance places heavier emphasis on more duplicate monsters and having them skilled up. As such, I wish to explore what makes a monster a good candidate for skill inheritance by examining what makes a good leader and sub. On the other hand, subs are selected for their actives, awakenings, and typing/colour. Skill inheritance will allow for more flexibility in team building as you can better customize your needs, but keep in mind that if your secondary skill is charged, you cannot use your base monster’s active. Instead of naming each sub, I will breakdown the various actives into their respective categories so you can pick and choose what is most valuable to your teams. If you wish to read about popular leaders and their full sub list, please refer to my previous post HERE. A detailed breakdown of every monster can be found in my Master List post. It becomes quite apparent that the depth of gravity actives eligible for skill inheritance is quite low and is unfortunate because most of the best actives in this category are farmable and cannot be used. I omitted mono-colour orb changers as the list would be far too long and you can use your judgement on whether more orb generation is needed. As stated above, you will most likely wish to transfer a skill to those leaders, but you can also use this opportunity to improve some already strong subs. These subs generally have shorter cooldowns and the idea is to give them a more powerful active that takes longer to charge up. For example, the Venus has a short 4 CD active that is reasonably powerful, but can use some improvements. You could potentially give her a dual board changer such as Ilm for your mono light row team as a means to unleash more burst damage. Other examples of strong base monsters with short cooldowns and favourable awakenings include, but not limited to: the Valkyries , Dark Metatron , and Isis . You can use this logic to bring subs who have favourable awakenings, stats, and colour coverage without sacrificing too much for a desired active. Delays, gravities, and damage enhancing abilities will rarely be used more than once per dungeon and should be placed on a monster whose base active is seldom used. Great candidates would be the leaders listed above. Actives that would either be used more than once or require quick access can be used on subs with less critical actives or those with very short base cooldowns. A great example is Awoken Isis who is on a 3 turn timer and the bind clearing would not need to be used very often. In addition, you can use her active at any time to ensure you have the bind clearing ability ready in time. Furthermore, skill boost awakenings will be more valuable as the inherited skill is simply an extension of the cooldown. 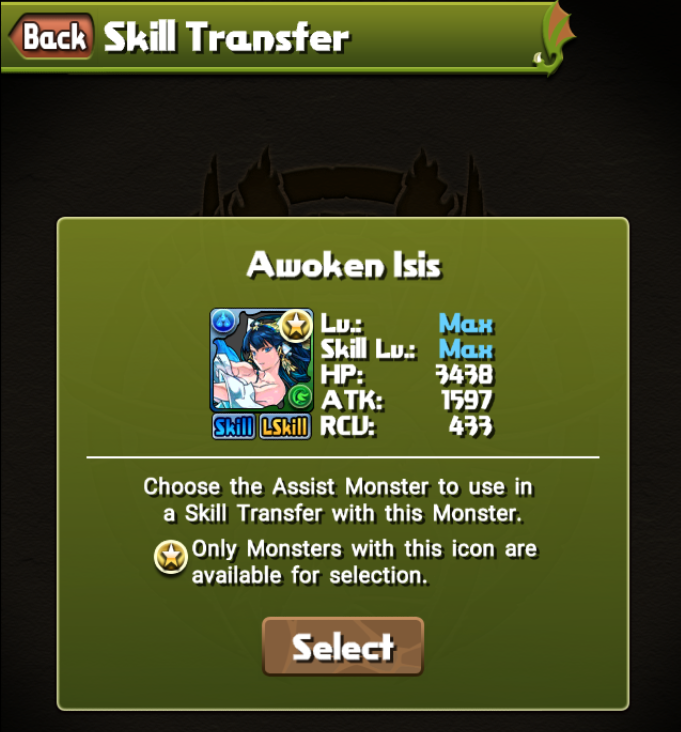 Take our Isis / Dark Kali example, if you had 9 skill boosts, you can use Isis on turn one. On your second turn, you will be able to use Dark Kali as it will have been fully charged. This becomes more crucial when dealing with longer cooldowns and inherited skills. I go into more detail in my follow up post describing more advanced strategies HERE. Many teams would love to bring more full board changers or enhancers to the party, but may be unable to do so due to their monster box containing the wrong colour cards or unideal awakenings. For example, Awoken Lucifer teams only want to run dark devil/gods, but with skill inheritance, you can now give your regular monsters with powerful board changers that did not come from dark based cards. For example, you can transfer Karin or Meimei as they generate dark orbs (and can be combo-ed with someone like Pandora for 2/3 dark orbs). Conversely, you can also gain assistance from Ronia or Cameo for more flexibility. The options are endless and you need to look what is casually sitting around in your monster box and dare I say it, think outside the box. Some teams may struggle with binds and your monster box may not allow you to bring an on colour/type sub to handle them. With Skill Inheritance, you can create bind clearing subs from an already bind immune monster. 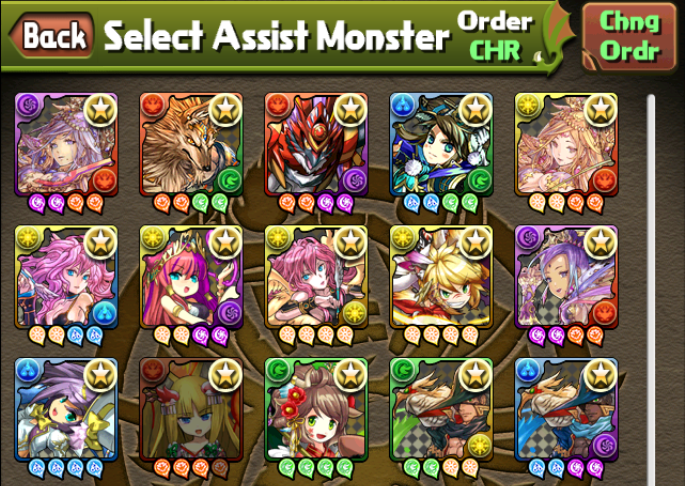 For example, Lu Bu is a fantastic dark/devil sub for Awoken Pandora teams who has ideal awakenings and bind immunity. 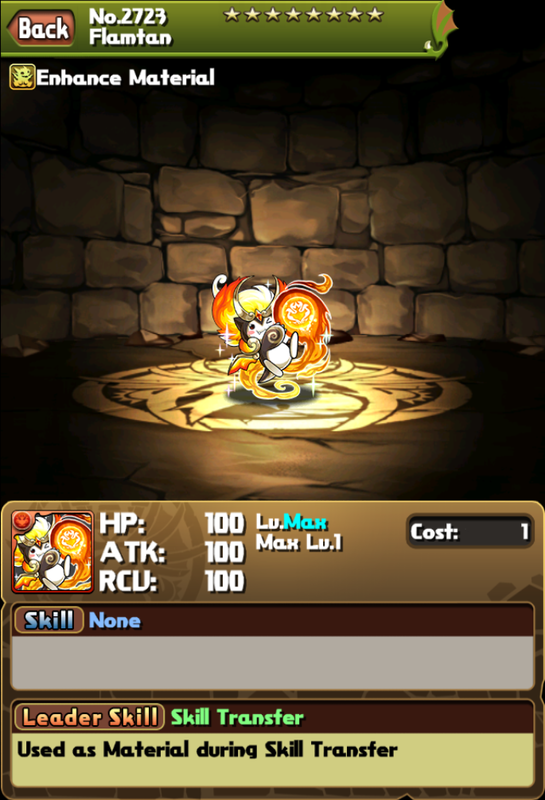 You can then inherit a bind clear active such as Ame no Uzume to counteract binds. Granted it will take 17 turns to do so, but you did not have to sacrifice a sub slot on something less ideal while retaining the chance to use his 3x devil nuke. Newer dungeons are introducing the skill delay mechanic and skill inheritance is a way to counteract it. Because Skill Inheritance is simply an extension of an existing cooldown, you can use it as a shield for when the boss delays your skills. Using our Isis / Dark Kali example, if we are on turn 7 (thus still Isis) and have our skills delayed by 2, we can still use Isis as our cooldown timer will be on 5. Expanding upon this, we can even inherit the same active onto the same monster as a means to essentially be delay proof (and always having the correct skill). This may not be practical for everyday usage, but is something to consider or at least using an assist active that is very similar to your base. This is a horribly loaded question and is probably on the forefront of most player’s minds. Sadly, there is no perfect answer as skill inheritance will be used to fill the voids in your team when facing specific dungeons/mechanics. If you need a bind clearing active, you select a bind immune card, go to the list of bind removing actives, and inherit. If you need a board changer, same logic applies, but you can choose your least valuable active to use as a base. You need to systematically go through the list of assistance subs I provided above and find what you have at your disposal and determine if you need to bring those for that specific encounter. Skill inheritance brings forth an entirely new way to play Puzzle and Dragons. We now have the option of creating our ideal subs at the cost of a longer cooldown. Our team building options are now endless and will give us a chance to finally utilize some of our pulls that have been collecting dust or sitting pretty in our monster box. What will you do?